OtherPeoplesPixels: How do you think the concept of “going feral” shapes your work? It seems to factor into a number of your works dating back to your 2006 video Centaurides, in which a computer modified child—like voice shares her fantastical observations and dreams; most of which involve a desire to break—free from the mundane, civilized, or unjust. Molly Schafer: Yes exactly! “Going feral” is my out to the mundane daily human life. As I see it back in the day we had it all—tons of time outside, traveling around with the seasons, NOT MULTITASKING, self-reliance, physical strength and endurance, being in the moment and more connected to nature/each other/other animals/Earth/the universe… and then we decided to live in dark, dirty cities buy stuff from stores and sit in offices all day. Blah who wants that? Well it turns out lots of people do. And the idea of “going feral” becomes threatening to society. Perhaps it partially represents everyone’s underlying longing for freedom and/or fear of that desire. Feral is a term referring to a domesticated creature that has returned to a semi-wild state. In a way, a hybrid state of being—not truly wild, no longer domesticated. I related that to the work I was doing with lady centaurs, themselves a hybrid of woman and horse. While in graduate school I received feedback that people had trouble relating to the centaurs since they didn’t reflect their own human bodies (unimaginative, no?) so I decided to take that wildness and hybridity I depicted through the physical body of the centaur into a fully human body having gone feral. A major influence on this work is my first entry point into this theme: young adult novels featuring a girl who has isolated herself from society, lives in the wild with an animal companion. I have had a life-long desire to live in one of those narratives, and I do realize it is slightly silly but I am sincere in that longing. 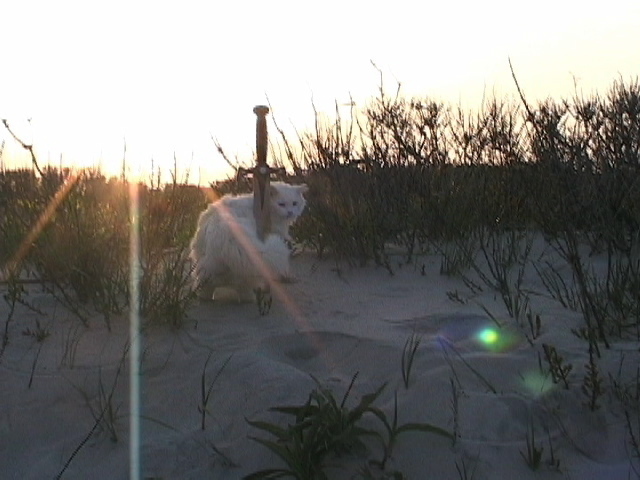 My journey to and stay on Asseateague Island with my cat was my attempt to access a bit of that world. The trip resulted in a body of work Dawn Horse. The drawings in that work reflect the iconic images on the cover of such novels, often the only image in the whole book, their function is to only tell part of the story. OPP: Hearing a child-like voice narrate Centaurides makes me curious about what you liked to draw as a child. What were your early sketchbooks like? MS: Ha. Yes they weren’t too different from now. Animals, girls/women. More penguins (I was into penguins way before it was cool). My brother and I grew up drawing while we watched TV. Our parents were/are artists. My junior high sketchbooks featured pencil drawings of awesome punk girls playing guitar. Lots of piercings, Mohawk hairdos, Tribe 8 shirts, L7 tattoos. The boys I knew were into drawing dragons, wizards and punk dudes. They always had trouble getting that we were into the same things. The gender difference or concept/awareness of gender (dragons vs unicorns) was so huge they couldn’t see past it. Not to mention they were intimidated by my skills. Lame. I dunno I’ve always liked drawing mice. I guess I’ve always fell somewhere between Beatrix Potter and fantasy novel art. Which may explain my limited successes. OPP: Your arctic-looking house cat plays a prominent role in your video from your Barrier Island series. 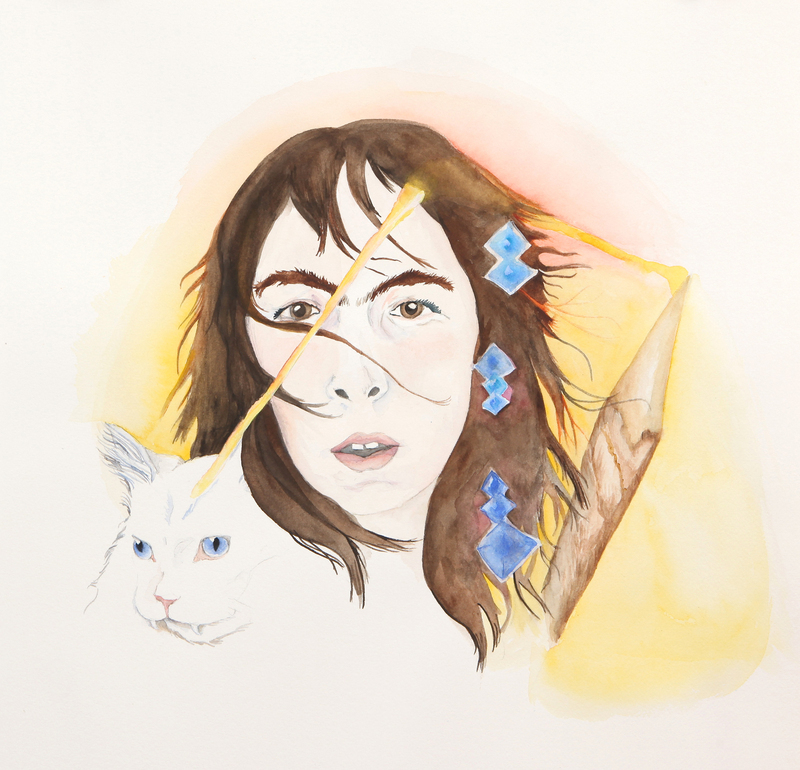 In reviewing images from your subsequent solo show, Dawn Horse, at Lump Gallery in Raleigh, NC, I noticed at least three other pieces that include visual references to your cat; one that even lists “my cat's fur” in the material list. Can you speak about the role your cat plays in your artmaking? Where does your house cat fit in your work’s relationship to real and imagined animals like centaurs what you describe as “similar hybrids”? MS: Well I’m glad someone is reading my detailed descriptions of media. Yes that is my boo. His name is Sid and he has been my dawg for 18 years now. I’ve always tried to let him be a cat and as wild as he wants to be. Once I took Sid to hang out in a park in Pennsylvania (where we both were born and raised) after an hour or so of us just chillin in some woods he started loosing control. He ran around, ate some rabbit poop and got this crazy look in his eye—shiny and wild, like he didn’t recognize me. There are moments—the realization there is no leash and he can run far, when he is at the top of the tree and is considering leaving me—when I dare say he is hearing the call of the wild. Those moments were fascinating and frightening. I related to them and was inspired by that to make this work. As I mentioned earlier I wanted to live like the characters in my favorite novels—Reindeer Moon, Julie of the Wolves, Island of the Blue Dolphins. These characters all had a faithful friend/sidekick who was a non—human animal. I had Sid. And I wanted to see how feral he would go. So we went to Assateague Island to get weird. Also I mainly make my objects out of whatever I have around with a nod to the materials used by and usefulness of the characters in those novels. Often they validate the killing of animals by using all of it’s parts. I don’t really kill anything for parts but do want animal parts in my work. Sid has plenty of fur to spare. And he and I are linked in a way that it adds meaning and magic to work parts of us into objects. 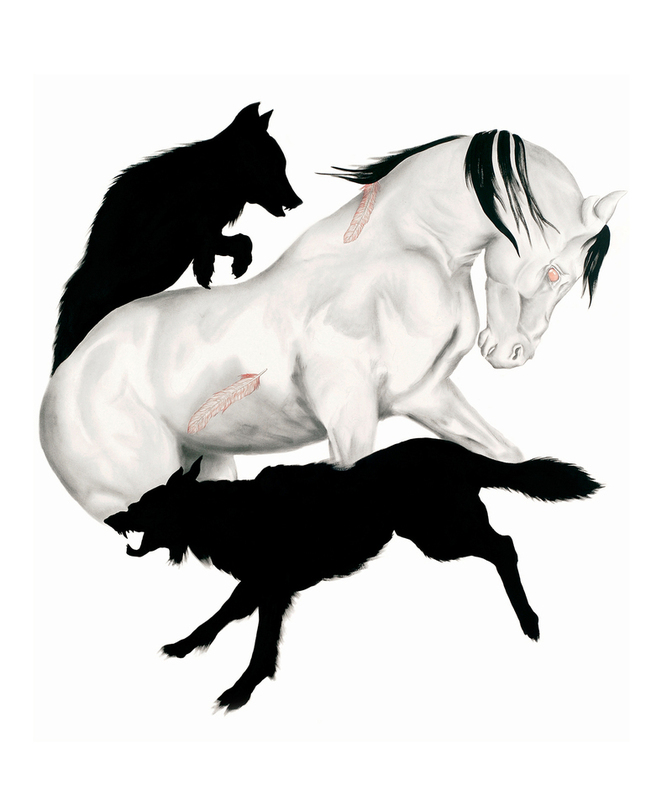 OPP: Your drawings of animals, centaurs and similar hybrids are often incredibly detailed. What kind of research goes into creating each piece? MS: Hmm looking at books— field guides, pony guides, Equus Magazine. Reading about how their parts work. I also spent time with and photographed my aunt’s horses. Observing creatures in the wild or growing up around them helps. Just getting to know them. Repeatedly sketching. Honestly I have one trick that I think works best but I consider it a trade secret. Let’s just call it “becoming animal” because I like phrases that sound like the cover of hilarious fantasy novels. OPP: Your own art practice is hybrid in nature. You maintain an individual art practice exhibiting your work widely but also operate outside of the gallery system using your artistic talents to directly support conservation efforts and biodiversity as the co-founder of The Endangered Species Print Project (ESPP). Let’s talk about what ESPP is, how it got started, and how it relates to your work as an individual artist. MS: Sure. The Endangered Species Print Project, according my collaborator Jenny Kendler, is our brain-love child. We both have strong feelings about conserving biodiversity on this planet. We had been fumbling around looking for a way to use our artistic talents and skills to benefit a cause we cared about and to make an impact. ESPP is our best version of those efforts. 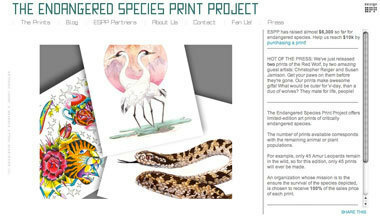 ESPP sells limited-edition prints of critically endangered species. Prints are editioned to reflect the remaining population count of the species depicted. For example, there are only 37 Seychelles sheath-tailed bats remaining in the wild. So only 37 prints of my drawing of this bat will ever be made. Currently 100% of the proceeds from print sales are donated to a conservation organization working to conserve the species on the front lines. When we started it was only Jenny and me. We have grown to include many guest artists, a blog, and an ESPP extended family which includes artist Christopher Reiger, OtherPeople’sPixels, who sponsors the project, Michael Czerepak of the School of the Art Institute (SAIC) Service Bureau who masterfully prints our work (and who asked me to marry him), and P.O.V. Evolving in Los Angeles, who handle our large print orders. Our work would not be possible without the help of the conservationists and organizations that we partner with nor without the many people who buy ESPP prints! OPP: What are you working on now? MS: I’m in one of those stages were I am doing lots of little stuff, working up to the next big thing. So I’m slowly working on some books, maybe they fall into the graphic novel category with the chimp hybrid women I was drawing a few years back, I still have a few paintings to make to round out the Dawn Horse work. I’m also working on a collaborative project with artist and pal Tory Wright. I’ve collected a bunch of video and text to make a new narrated video, but at the moment I’m planning the piece to incorporate a good amount of hand drawn animation so I predict this will be a years long project. I’m fascinated/jealous of large predators so I collect pics of them on my blog Megafauna . I’m moving into a new studio soon so I’m looking forward to that! Honestly, I’m designing my wedding invitation. Is that lame? So far it features an eagle, a hawk, a peacock, a fox, a bear, a badger and a hare. I think someone else but I’m not sure. Oh! That’s right a slow loris. 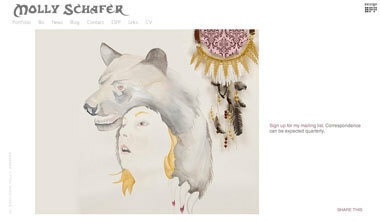 To view more of Molly Schafer’s work visit mollyschafer.com. OtherPeoplesPixels: You describe exploring technology in your work both as subject and media. 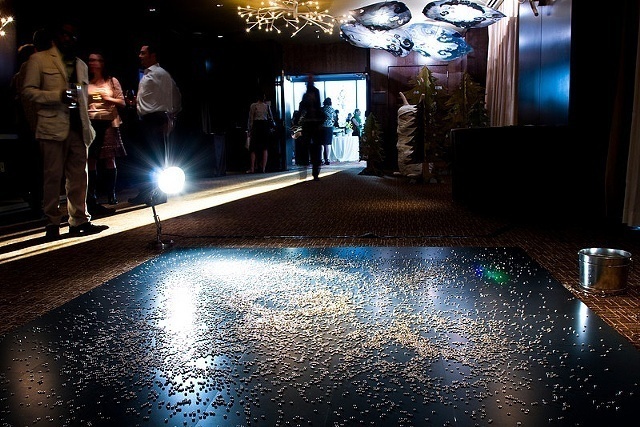 In doing so your primary media are installation and performance. Let’s talk about the relationship the performances and installations have to one another in your artmaking process and how the combination of disciplines plays into how viewers perceive your work in varying locations. Sara Schnadt: I am trained as a performance/installation artist so I naturally think about ideas as live gestures and environments at the same time. Space, architecture and gesture are fundamental to how I think. In the past four years the installation component of my work has developed to the point where the intention holds up without the live presence. This has opened up the possibilities for my work in terms of where and for how long I can show a work (a month with regular performances versus an evening) which has been exciting. Most of the time a live activity is integral to my work, though. It's at the heart of the work's concept, like building the internet in Connectivity or creating versions of the universe in Drafting Universes. I also sometimes use found movement in a similar way to how I consider found objects. I see them as materials with a previous life and history. For example my piece Reading Gestures uses found pedestrian movement—body language that people use to create a private space in a public library in order to get lost in what they are reading. It was created for a space that was the Chicago Public Library's reading room from the 1880, through the 1980' and drew from images of readers spanning this time period for movement material. I do have two recent pieces that are installations without a live element. 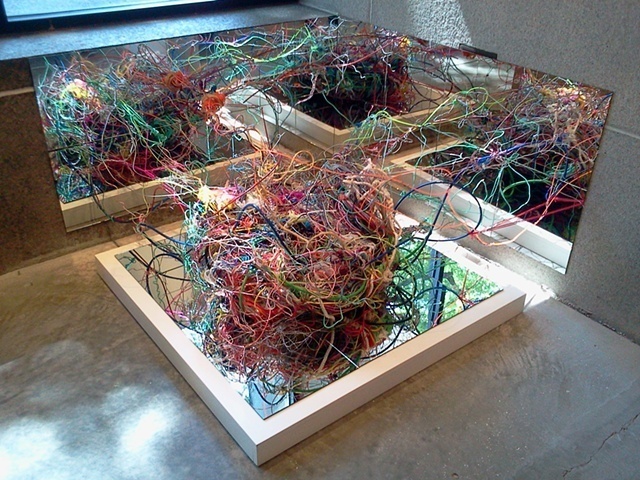 But one of these is an adaptation of a performance remnant—a mistake when the room-scale installation component of my Connectivity piece (a representation of the Internet in string and wire) was sent back from an international show as a compact three foot ball. The other, Network, is the idea of a gesture in string—a virtual network structure cutting across an ordinary space. But even this piece is going to become a performance in it's next iteration. When I am there live inside of my work, the audience tends to take on an engaged spectator role or sometimes they respond like they are seeing the inside of my studio and are interested in getting close to the creative process. When I am not there live (either during the run of a piece with scheduled performances or with my pure installation pieces) I think that the audience experiences my work more actively and intimately because I am not there to serve as an intermediary. The experience of the work is much more charged when I am there live however, and there is a place for both kinds of engagement in most of my work. OPP: In reviewing the performances you’ve created in the last decade I am especially interested in noting each work’s duration. Many range from one to three hours performed multiple times over the course of an exhibition while others occur once and last a few days. Could you speak about how you determine the duration of a performance? SS: I consider the format of the presentation opportunity as part of the site or situation I am responding to. In most cases, the overall duration or run of a piece is a response to the opportunity (a one-night-only, site-specific performance festival versus a month-long run in an exhibition space). If I have the time to create a series of performances within a larger exhibit time-frame my preference is to perform for three hours at a time. This gives a focused enough time window that you can have a decent accumulation of audience (which really gives the work energy) but also is long enough to push me beyond my comfort level for stamina. Pushing past this point, which happens usually about an hour in for me, puts me in a heightened meditative space and makes the performance more transformative because I really become part of the work. OPP: I am similarly interested in your costuming in the performances you’ve created in the last decade. In Drafting Universes and Continuity you are dressed in what could be interpreted as business attire, and in Network and Network Hub you are dressed in everyday attire, while in Connectivity you wear a custom-made orange jumpsuit that could be described as both futuristic and prison or inmate apparel-inspired. What factors go into your costuming choices? SS: I think of the costume as part of the sculptural element of each piece. Some of my work is more abstract and some more pedestrian in it's vocabulary, and so the costumes vary accordingly. If there is a real type of person I am embodying for the piece, then I will put together a costume that suggests this person. For Continuity my intention was to be dresses in historically-ambiguous travel attire, since the piece included a large collage of travel images from a wide range of historical sources. I also chose the color palette of this costume to match the piece. For Drafting Universes I was a scientist or science worker, but I also wanted to keep the read very open so the audience could make a variety of references from my activity. I actually rotated through three costumes during this performance because it was a little tricky to get the balance just right. Also the installation element is very abstract visually, so a lab coat was just too literal. I will fine-tune the costume more for its next showing. For the building of Network we are wearing street clothes because the installation process is not part of the work. With Network Hub, (a piece about airplane flight patterns) I am shooting for a balance between a pilot and a stewardess, since both those roles facilitate flight. Also, simple lines and a single color look good formally with the piece. I have worked with a fashion designer for one on my pieces, Chicago-based Agnieszka Colon. She lent me a gown that she made out of a woman pilot's flight suit, which I wore to be both an architect and municipal worker role as I 'built' the Internet in my piece Connectivity. OPP: Connectivity celebrates Web 2.0, the collective activity of creating and sharing information online. Web 2.0 is integral to the website and online community you created as co-founder and technologist for Chicago Artists Resource at the Chicago Department of Cultural Affairs and Special Events. Do you consider yourself a hybrid artist in that you work at the intersection of art and technology in both your work as an artist and your work with Chicago Artist Resource? How do the two inform one another? SS: Yes, absolutely they do inform each other. And yes, I do consider myself a hybrid artist. Or just an artist with multiple intersecting interests. I got involved with arts administration early in my career. I wanted to understand the infrastructure around artists' practice in order to give my own work a context and to participate in activities that enrich this infrastructure and allow me to be part of something greater than myself. My work with CAR has directly affected my art practice. It has expanded my art network both locally and nationally, inspired me to focus on technology innovation as a central theme in my art, and shown me that I can pull off large complex projects. The scale and ambitiousness of my art has grown as a direct result. My art practice also affects my work with CAR because I am much more effective as an advocate for artists' professional practice when I am actively practicing myself. In terms of working at the intersection of art and technology, this is just where I feel most engaged. OPP: You keep a research blog that is accessible from your website. How do you approach researching some of the specific details and networks that appear in your work? How do your viewers tend to engage with the information you present to them both online and in exhibition spaces? SS: I've realized over the past few years that the scale, complexity and processes in my art have been informed by my work with Chicago Artists Resource. Overseeing development of this large and comprehensive web site has involved a lot of research on professional practice content for artists. A taste for research-intensive creative process has since become part of my art. Sometimes this has meant researching global internet access, sometimes data visualization, sometimes found movement, and sometimes large quantities of images. Sharing interesting information that I come across on my blog is something I do for further background on projects, and because some of the stuff I've found is really fabulous. In addition, some of my finished projects include specific information that is relayed as part of the work's concept. When this happens I think of the art as a data visualization, and it has to be clear, direct and informative. I never want my work to be dependent on reading the label to get its ideas across. Other projects are supported by my research, but factual data is distilled and abstracted in the final piece and has become something else, more aesthetic. OPP: What is next for you? SS: What's next for me job-wise is finalizing plans for national syndication of CAR, which I've been working on for the past year. I'll also be overseeing the upgrade of the current CAR site so that the interface is more user-friendly and the large quantities of content on the site are more prioritized to artists' interests. And on September 29th, I’m moderating a panel on social media strategies for artists at Chicago Artists Coalition. 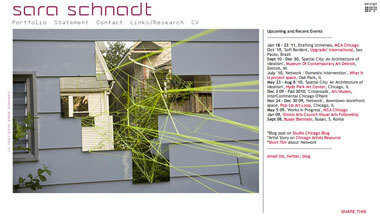 Art-wise, I have a solo show at Counterpath Gallery (Denver) which opens September 2nd. I'll be their inaugural show. And in October I'll be doing an 'Artists Connect' talk at the Art Institute of Chicago, discussing my work in relation to Agnes Martin, Sarah Sze, Olafur Elliasson and others. For the end of the year I’m learning to code and developing an interactive data visualization for the Apps for Metro Chicago Competition, based on data from the city’s new open data initiative. I am also beginning to develop a new movement/new media/installation work that involves performing a social network. Longer term, sometime next year, I am doing a project at Minus Space (Brooklyn) in their new Dumbo space. I’m excited to work with Minus Space because their invitation to join their flat file has really influenced my work over the past two years. Applying the lens of minimalist reductive art to what I do has egged me on to try new directions and distill my ideas into simpler forms. To view more of Sara Schnadt’s work visit saraschnadt.com.